Have you read The Graveyard Book? That might be a good choice. I joined this one too. I'm hoping to overlap with my series challenge. Twisted is excellent. So far I've loved everything I've read by Laurie Halse Anderson. And, after only one book by John Green I've got an author crush. joy - no, I should get it for my 11 year old son. tink - Many of these will overlap other challenges. I find YA are quicker reads, but just as satisfying. bookfool - I read Speak this year and liked it. It's easy for me to get the YA books, at my high school library. Twilight is making the rounds in classes right now. And it's not the kind of book they can easily hide, it's a brick! suey - I got a few of those titles from your blog, especially the John Green. You and Dewey and bookfool have been gushing about him, so I must find out. You guys all have great taste in books. Awesome list! Did you know about the Cornelia Funke challenge? I will so be joining in this one too!! 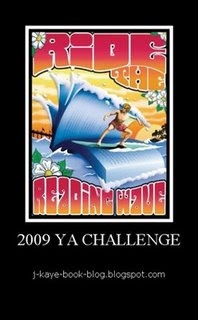 The YAC challenge is one that i know I can definitely complete!! I read Twisted this year. Excellent book! j kaye - thanks for the welcome. I didn't know about a Funke challenge, I'll have to peek around. stephanie - I loved Speak, so I expect Twisted will be excellent as well. joanna - I got a few of my titles from alisonwonderland. She had a list of recomended YA titles, and several I've loved were there too, so I added some of her ideas.